Google released the $US80 Pixel Stand, a wireless charging pad that turns the new Google Pixel 3 into a smart alarm clock when it’s docked in. The Pixel Stand is available for preorder before it hits store shelves on Oct. 18. Technically, the Pixel Stand will work to power up any smartphone that supports wireless charging – including recent-model Apple iPhones. On Tuesday, Google announced the Pixel Stand, an $US80 charging dock that will work with any smartphone that supports the Qi wireless charging standard – including Apple’s latest iPhones. However, as you may guess from the name, it’s designed to work with Google’s just-announced Pixel 3 smartphone. The Pixel 3 and 3 XL phones, which Google revealed at its big hardware event Tuesday, will be the first smartphones from the search giant to support wireless charging. 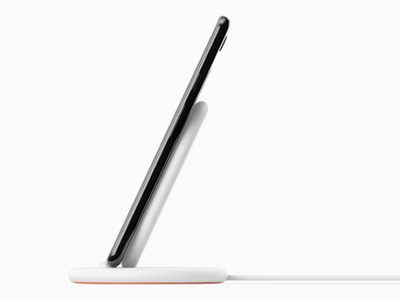 And while that means the Pixel 3 works with the most any of the third-party wireless chargers already out there, the phone will actually go into a special mode while it’s charging from the Pixel Stand. While in the dock, the Pixel 3 basically becomes a smart alarm clock that’s designed to live overnight on your bedside table. In the morning, the stand will adjust your Pixel 3 screen’s brightness in a way that “mimics the sunrise,” and shows you that day’s weather, what’s on your schedule, and how long it will take you to get to work. At night, your Pixel 3 is switched to “do not disturb” feature when you’re going to bed. It will also display photos from your Google Photos account, making it something like a smart picture frame. Plus, it will respond to voice commands, just like the Google Home smart speaker. Just say “OK, Google” and you can ask questions, get your calendar, or even control your smart home gear. Google says that the Pixel Stand is capable of fast wireless charging, though how fast that is in real life remains to be seen. Also, it’s not immediately clear if you need the Pixel Stand to access this alarm clock mode, or if it will work with any wireless charger. We’ve reached out to Google for clarity and will update if we hear back. On the subject of other wireless chargers: the Pixel Stand’s price of $US80 is significantly higher than that of other top wireless chargers. The Belkin Boost Up 10-Watt wireless charging pad, which Insider Picks recently named the best wireless charger for your phone, only costs $US60 on Amazon.